Is ‘sucking up’ really the only reason Christians try to be good? I’m sure there are lots of people out there who believe that. And, sadly, I’m sure there are followers of Jesus Christ who do, in fact, live with this sentiment in mind. I’m not one of them. And neither are most other Christians who know the truth of their faith. And that’s why this graphic, found on an Internet atheism community, so hugely misses the point — and that’s disappointing because the author is a shining star in the atheism world and probably knows the Bible inside and out. All that said…. I try to be good because I want to be the person God knows I can be. In fact, when I decided to follow Jesus (at age 42), I welcomed God’s holy spirit into my heart and mind to help me be a better person – because I simply couldn’t do it on my own. I try to be good because, in a section of the Bible called ‘Matthew’, Jesus Christ (whom serious Christians, and many others, believe is the son of God) tells his followers “Anything you did for one of the least important of these brothers and sisters of mine, you did for me”. I try to be good because, in another section of the Bible called ‘James’, we’re told “Isn’t it obvious that God-talk without God-acts is outrageous nonsense?” In other words, I wouldn’t be much of a Jesus follower if my faith didn’t result in me at least attempting to do good. I try to be good because a part of the Bible called ‘Titus’ puts it this plain and simple: “God’s people should be bighearted and courteous”. Finally, I try to be good because as a serious Christian, I believe Jesus Christ was crucified to make up for the bad things I’ve done and the good things I’ve failed to do. Given his incredible sacrifice to wipe my slate clean with God, the least I can do to show my gratitude is try my best to get my act together. Anyone who knows me also knows that I often fall short of being “good”. (Just ask my very patient wife.) But that’s why I follow Jesus. That’s why I attend church regularly, so God can use the pastor and other Christians to encourage me and instruct me on being good. What do you think of this? Post your thoughts below and let’s have a conversation. Dawkins completely misses the point which you have described so beautifully here. We do good things for others and show kindness and courtesy because Jesus sets the example and the standards. Like you, I fall short of the mark, but knowing He loves and forgives me, picks me up and brushes me off and says, “Try again,” is ever comforting. Thanks for another inspiring post, Frank! Blessings! We all fall short Frank. But I keep trying because it’s our job to tell the world about Jesus Christ and his message of Salvation. What better way than to lead by example in trying to emulate him? And that means being good and kind and forgiving and trying to do what’s right in all things. Peace. However, because God robed himself in flesh and chose to pay the price for our sins (through Jesus Christ), we can have fellowship with Him if we follow His plan of salvation as outlined to the early church in the Bible’s Book of Acts. And once we have died to our past life of sin, been buried with him in baptism and filled with new life by His Spirit, we want to walk in holiness – because He is holy. Jesus summed it up nicely, “If you love me, keep my commandments”. So like you, I want to make sure that I get my act together! And just in case I think that I can do it on my own, the Bible also tells me that without Him (Jesus), I can do nothing. The Bible’s Book of Galatians explains that in my flesh I can’t live as a Christian. It is only by the Spirit of God working in my life that I can live successfully as a Christian. I am so thankful that God opened my eyes to sin in my life, showed me how to escape from the death penalty that I deserved, and helped get me onto the path that leads to eternal life! God is so awesome! I like how you responded to Dawkins comment. He is so mislead or misinformed if he thinks that’s why we try to be good. First, don’t all people try to be good, whether they are Christians or not…isn’t that a part of any “religious” doctrine not to mention a goal for all humanity? Second, I could NEVER be good enough to earn the approval of a holy God with all my faults. Thankfully I don’t have to be good enough because Jesus took my punishment for all my faults and mistakes, so when God looks at me, he sees me through the forgiveness Jesus died to give me. Third, I deserve Gods disapproval and punishment so again, I could never be good enough–that’s the beauty of Grace! Gods unmerited favour and mercy! Not receiving the punishment I deserve! Dawkins does not miss the point. I think you miss the fact that his question was rhetorical. As a humanist, he believes that everyone has goodness within them, whereas the Christian philosophy is that all of us are so evil that we deserve everlasting torment merely for the act of being born. The fact that you and other Christians attribute your morality to your God rather than to your innate goodness is one of the things that Hitchens meant when he said “Religion poisons everything”. Before you were 42, did you not try to be good? If not, then its probably a good thing you became a Christian. If you did try to be good, then what motivated you back then? If there are people out there who want to believe that Dawkins was asking a rhetorical question, that’s certainly their right. 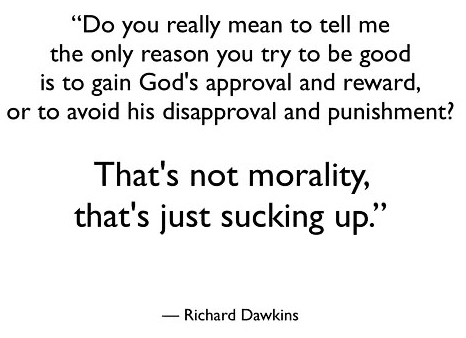 And if people want to think that attributing morality to God is wrong, that’s also their right. Please note, however, that Frank’s Cottage is not meant for atheists. It’s meant for people who are open to spirituality. Are you claiming that one has to convert to Christianity in order to avoid pursuing all the vain, shallow and meaningless things our broken culture says are important? My girlfriend is a lifelong atheist, owns her own modest house with no debt, bought a car with cash she had saved, and shops at Goodwill because she likes the idea of recycling clothes. She doesn’t pay for weekly trash hauling because she literally generates less than one bag of trash per week, composting the rest. She is a vegetarian because she cares about the way the animals are raised. Her home has three bedrooms, but one room is COMPLETELY empty because she just doesn’t see the need to own a lot of stuff. I absolutely guarantee you that she lives a simpler, less shallow life than either you or I. It is more than a little offensive for you to insinuate that those who don’t share your mythology are shallow and materialistic. ….and she’s a Registered Nurse who cares for elderly patients. What you wrote is offensive to 80 percent of the world population, as well as being logically unsound and arrogant as well. Adopting Christianity is simply neither necessary nor sufficient for living a nonmaterialistic lifestyle. And your continued reference to me as a “hardened atheist” is both a blatant ad hominem argument as well as a transparent dodging of the points I raise. Thanks for your opinions, Bruce. All my past interactions with you strongly suggest you don’t seek a conversation. You seek to win a debate. That’s not what Frank’s Cottage is about. Frank’s Cottage is a petty deception, and a fraud. Frank pretends he wants dialogue, but the truth is that he is only pushing rigid Christian doctrine. Frank pretends to be open minded, but actually holds rigid, unreasoning views about atheists, and all “unbelievers.” Frank’s employer is Billy Graham Evangelistic Association of Canada, and Frank is an evangelizing Christian, but he tries to hide this in the fine print. Beware of these deceptions on Frank’s part. You will ultimately get nothing here at Frank’s Cottage but rigid Christian doctrine, smarmy pretense, and obnoxious dismissal. Nice going, Frank. You’re really representing Christianity ever so well. Anyone who goes onto the “Welcome” page of this website will immediately see who my employer is. Some may call that “small print”. That’s their perogative. And if some want to dismiss this website as “smarmy pretense and obnoxious dismissal,” that’s also their opinion and they’re welcome to it. I’ll leave the rest of the above comment for readers to make their own judgements. Please note, however, that Frank’s Cottage is not meant for atheists. It’s written for people who are open to spirituality.